This web page will inform you of the Inn at Pelican Bay policies regarding the collection, use, and disclosure of personal data when you use our Hotel website and the data we collect. We use your data to provide and improve our Hotel services. By using our Hotel website, you agree to the collection and use of information in accordance with this policy. 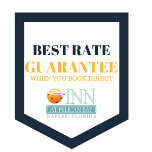 We understand that when you use the Inn at Pelican Bay website you are placing your trust in us to handle your data appropriately, including the personal information of you and your end users. That is why we take a very serious approach to data protection. We want to make sure that you have information about how we process personal information in connection with your use of our website. We collect different types of information for a variety of purposes to provide and improve our Hotel services and offerings and send occasional email communications to you. You will have a right to withdraw consent to store and use your data and have the information erased. If you wish your data to be forgotten/deleted from our database, please contact us info@innatpelicanbay.com to have the data deleted the Inn at Pelican Bay. Please be aware that if you opt-out of receiving an email from us or otherwise modify the nature or frequency of promotional communications you receive from us, it may take up to ten (10) business days for us to process your request. Number of links you click within the website. State or country from which you accessed the website. Web page from which you linked to our website. Pages you viewed on the website. Cookies are files with small amount of data which may include an anonymous unique identifier. Cookies are sent to your browser from a website and stored on your device. Tracking may also be used such as tags, and scripts to collect and track information and to improve and analyze our Hotel website. You can instruct your browser to refuse all cookies or to indicate when a cookie is being sent. Session Cookies. We use Session Cookies to operate our Hotel. If you do not accept our cookies, you may experience some inconvenience in your use of our website. The Inn at Pelican Bay does not collect financial information for payment processing. We will not intentionally disclose the Personal Data or Client Data that we collect ever with any third parties. We have no control over and assume no responsibility for the content, privacy policies or practices of any third party sites or hotels. Our Hotel does not address anyone under the age of 18 ("Children"). We work with a variety of third parties to attempt to understand the profiles of the individuals who are most likely to be interested in our hotel so that we can send advertisements to you on the websites and mobile apps of other entities. In collaboration with these third parties, we collect information about our customers, prospects and other individuals over time and across different platforms when they use these platforms or interact with them. Individuals may submit information directly to our Sites or on platforms run by third parties, or by interacting with us, our advertisements, or emails they receive from us or from third parties. We may use special tools that are commonly used for this purpose, such as cookies, beacons, pixels, tags, mobile advertising IDs, flash cookies, and similar technologies. We may have access to databases of information collected by our business partners. This will opt you out of many but not all of the interest-based advertising activities in which we or third parties engage. Choices you make may be browser and device specific. If you delete your cookies or use a different browser or a different computer or device, you may need to update your opt-out choices. Other third-party Sites provide visitors with the ability to opt-out of receiving interest-based ads on their Sites that you need to control your settings on that Site. For example, to opt out of Google’s use of your online behavior for advertising purposes, visit https://www.howtogeek.com/285835/how-to-opt-out-of-personalized-ads-from-google/. Our website include(s) interfaces that allow you to connect with social networking sites. If you connect to a social networking sites through our website, you authorize us to access, use and store the information that you agreed the social networking sites could provide to us based on your settings on that SNS. We will access, use and store that information in accordance with this Policy. You can revoke our access to the information you provide in this way at any time by amending the appropriate settings from within your account settings on the applicable social networking sites.